When taking Economics 101 you might be lucky to have a professor who, on the first day of the semester, forces you to think about the economic value of a college degree. The professor will point to your friends who chose not to attend college, but instead joined the work force. They are out there earning a living while you will take the next several years cloistered in the cocoon of the academy, spending money that you don’t have, all predicated against future earnings. The same thought experiment should be played out when considering graduate school. As we all know a bachelors degree will earn you a lot more than you would make with just a high school diploma. Most bachelor degree holders catch up and surpass their non-collegiate friends pretty quickly. But what about graduate school? What earnings levels can you expect from a masters, a doctorate or a professional graduate degree? Not surprisingly, when it comes to annual income, graduate degrees have outperformed the bachelors degree over the last nearly quarter of a century. In the aggregate. There is undoubtedly variation in specific fields of study and employment, but as a general rule, your masters degree will probably help you earn more income than your bachelors. And your doctorate or professional degree will probably help you earn more than what you might have earned with a masters. Probably. Not a guarantee. But the meta seems lined up in your favor. That’s the simple conclusion to draw from these observations. But then things get pretty complicated, since there are also some troubling findings in the chart above. The first, is that earnings, in constant dollars fixed for the rate of inflation, have stagnated over the past 25 years for all levels of college degrees. That’s not good. When the economy has grown but wages have not, even for the most highly credentialed workers, something is fundamentally out of whack. Over the past two and one-half decades, a higher degree gets you onto a higher wage track, but the wages on that track are as stagnant as they are on the bachelors track. Second, graduate degrees not only don’t erase the gender gap in earnings, they reveal the gap quite dramatically. Women holding masters, doctorate, and professional degrees earn substantially less than men with the same levels of education. Indeed, women earning doctorates and professional degrees make about the same or even slightly less than men with masters. There is a lot of scholarship and opinion out there on this topic. And to what degree, if any, does the growth in women taking graduate degrees account for the earnings stagnation? This is a complicated subject worth digging into down the road. Finally, the earnings volatility for those with professional degrees, and to a lesser extent those with doctorates, is surprising. 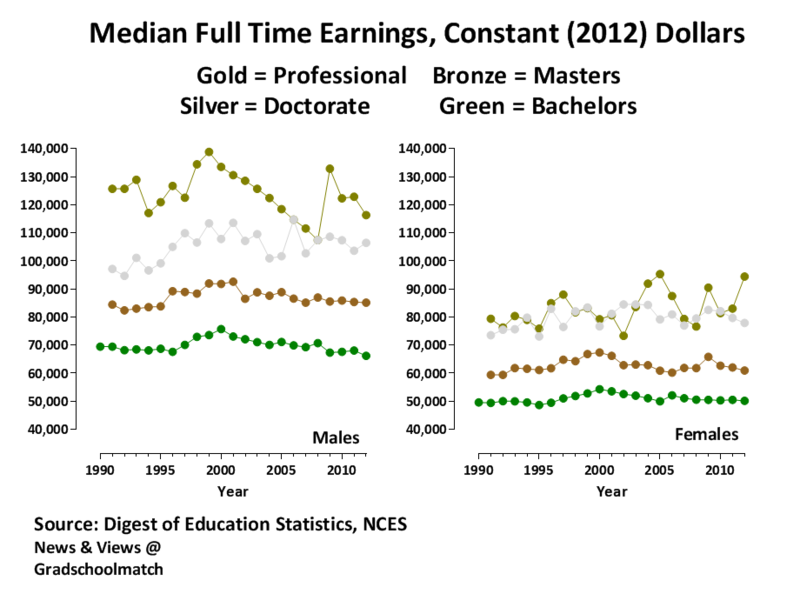 By comparison, although lower, the earning power of bachelors and masters degrees has been more stable. What are the causes of this volatility? A starting point will probably involve taking a peek at the health care and legal professions, where nothing has been normal over the past two decades. Despite all of this, and there are no guarantees and no doubt there are many exceptions to the rule, but the answer is a qualified yes; if you go to graduate school you will probably earn more money than you would earn if you don’t. Like this article? Sign up for Gradschoolmatch blog updates, and visit us at Gradschoolmatch.com to start matching with graduate programs for free.